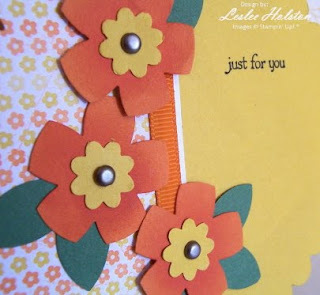 It's exactly what I had in mind for a scalloped circle card! And talk about easy-peasy! I laid my folded Crushed Curry cardstock onto the scallop circle die so that the fold wouldn't get cut off. On top of that, I placed my DSP from the Razzleberry Lemonade pack and ran it all through the Big Shot. I adhered the DSP, a thin scrap strip of Whisper White and a piece of Pumpkin Pie 1/4" grosgrain ribbon to the scalloped card base. The flowers are punched in Pumpkin Pie using the 5-petal flower punch, the points punched off using the 1-1/4" circle punch and then topped with a small Boho Blossom flower punched in Crushed Curry and a vintage brad. The Garden Green leaves are simply a 5-petal flower punched and cut into pieces. The sentiment is from the Teeny Tiny Wishes set. I know I've said this before, this set is awesome! It has a sentiment for every occasion. A must have for any card maker or scrap booker. Note: For a quick tutorial on how I double punched the flowers, check out this previous post. I really like how this card turned out and how simple it was to make. It fits into a standard SU! medium envelope with a little room on the sides. And that means that there will be no additional postage...unless you pile on the layers and embellishments. And that is completely up to you! I hope you've been inspired. 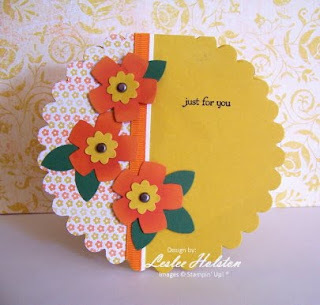 Try a scalloped circle and give the Clean & Simple Stamping site a look see! Be back soon with more creative inspiration.